When traveling, there’s no denying that having the right luggage can help your trip go much more smoothly. A quality piece of luggage that’s easy to maneuver and carry will eliminate some of the hassle you experience when traveling from place to place. With a nice bag, you won’t have to worry about something breaking, nor will you have to strain yourself as you race through the airport with your bags in tow. For many frequent travelers, the type of bag that’s at the top of their list is spinner luggage. 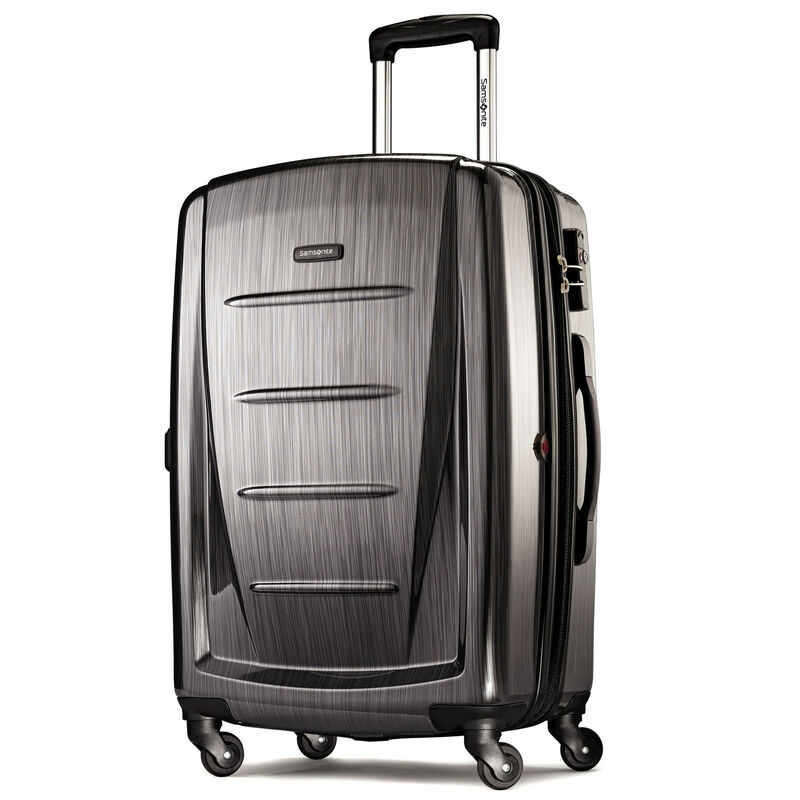 Spinner luggage contains four, multi-directional wheels on the bottom that have full 360° rotation. This provides you with a wide range of movement, thus making it easy to navigate airports, hotels, and other venues with ease. If you’re on the hunt for the best spinner luggage you can buy, you’re in the right place. To help you make a smart investment with your next piece of travel luggage, we’re sharing what you need to look for and what you should avoid. These tips will help you choose a great piece of spinner luggage that will last for years to come! If you’re not familiar with spinner luggage, you might be wondering what all the fuss is about. This particular style of suitcase provides a few different benefits for the traveler, which is why they’ve become so popular among frequent flyers. In fact, a great piece of spinner luggage can help eliminate some of the stress you may feel when traveling. First, spinner luggage is actually very easy to maneuver. These suitcases have four, multi-directional spinning wheels as opposed to just two wheels that only move forward and backward. Since these wheels have 360° rotation, it allows you to move the suitcase forward and backward, as well as side to side. This is perfect for getting through a busy airport, making your way to your hotel room, squeezing through tight spaces, etc. Getting yourself and your luggage from place to place is less of a hassle with spinner luggage that’s easy to move about. Having four wheels on the bottom of your luggage is another major plus. Your bag will be less likely to topple over than a two-wheeled suitcase because the addition of two extra wheels provides better balance. This will make your suitcase much easier to use and travel with when you don’t have to worry about your bag falling over. One thing to keep in mind is that you’ll want to select a bag with a locking system so those spinning wheels stay in place! If you find that a two-wheeled suitcase puts quite a bit of strain on your body, spinner luggage may be a better option for you. When you consider how heavy a suitcase is on its own, plus the addition of everything packed inside, it’s no surprise these bags can cause a few aches and pains after a long travel day. With four, multi-directional spinning wheels, these suitcases will put less pressure on the shoulder and arm you’re using to push your bag around. Spinner luggage can be maneuvered in any direction with very minimal effort on your part, which causes less strain on you. This makes spinner luggage specially popular with older travelers and those with limited mobility. Choosing the right spinner luggage doesn’t have to be hard. Below you’ll find exactly what to look for to make the right choice. When choosing the right spinner luggage for your next adventure, one thing you absolutely need to look for is durability. Not only do you want the luggage itself to be durable, but you also need sturdy wheels that can withstand the beating they’ll surely take during travel. 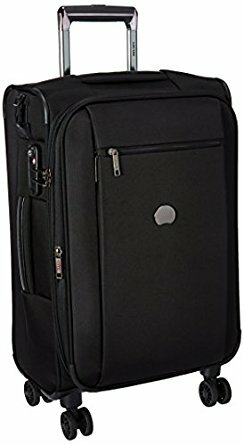 You want to select a piece of spinner luggage that will hold up during your travels and also last you for years to come. You don’t want to invest in something that’s going to fall apart after only a few vacations. Luggage that is likely to stand the test of time will be made out of quality materials, have tough wheels, sturdy handles, and strong zippers. That doesn’t mean you have to break the bank when purchasing new spinner luggage though. There are plenty of reasonably priced options that are high-quality. Another durability factor to consider is whether or not you’d like your spinner luggage to have a hard outer shell or a soft shell. Hard shell suitcases that are available today are typically made with a polycarbonate exterior, while soft shell suitcases are made from heavy fabric or leather. The great thing about the hard shell luggage is that it can provide some extra protection for your belongings inside. This is ideal if you’re going to be storing any tech gadgets in your bag, as it prevents them from getting banged around too much. The hard shells are also easy to clean if they get dirty because all you have to do is wipe them down. Alternatively, soft shell luggage certainly has its benefits as well. If you’re planning to store your luggage in an overhead compartment on the plane, a soft shell exterior gives you a little more wiggle room when it comes to getting your bag into a tight space. You’ll be able to squeeze your bag in as long as it’s within size requirements. Another great feature is the added outside pockets that soft shell luggage has. Having zipper compartments both inside your luggage and on the outside is certainly a plus. These compartments can help you organize all of your belongings, as opposed to just tossing everything into the main compartment. You won’t have to worry about something going missing or spending time digging for that one item you need. Most suitcases have a few compartments, but if the one you like doesn’t, you can always purchase a separate luggage organizer to keep everything tidy and in its place. Before you commit to a purchase, it’s a smart idea to check out some spinner luggage in person and take them for a test drive. You’ll want to buy a bag that is easy for you to maneuver without requiring much effort. Walk around with the suitcase, push it forward and backward, and move it from side to side to see how it feels in your hand. The spinner luggage you buy should glide across the floor. You shouldn’t feel strained as you move it around. After all, a suitcase that’s easy to move will be less of a hassle on you when you’re trying to get through a busy airport. If you can’t get to a store to test them out in person, do your research by reading online reviews. You’ll also want to consider if you’d rather have a two-wheeled suitcase or one with four wheels. Although two-wheeled suitcases can still be easy to manage, they are prone to tipping over if they’re not balanced properly. With four, multi-directional wheels, you have more range to move your bag around. You can push it forward and backward, as well as side to side with ease. Your best bet is to try them out in a store if possible. Many suitcases are heavy on their own, which only becomes more of an issue once they’re filled with your belongings. If your suitcase becomes too heavy for you to lift, you’re going to have a problem when traveling. It’s unlikely that there’s going to be someone around to help you lift your bag out of the truck of a car or place it into the overhead bin. For this reason, you can’t overdo it when it comes to your spinner luggage. You need to choose something that’s lightweight and easy for you to lift without causing physical strain. Consider the weight of a bag before making your purchase and make sure it’s within your own limits. Plus, consider how much you’ll be packing inside your bag and how much weight it will add. You also need to think about the size of your bag. How much stuff will you be packing for your trip? Will you only be taking a carry-on or will you have to check your bag? It’s important to keep luggage size in mind when making your purchase so you’re within the regulations of the airlines you’ll be flying with. You’ll need to do your research beforehand to find out. You don’t want to discover that your bag is too large after it’s already too late. If you’re searching for a carry-on bag to bring along on domestic flights, you’ll need to keep your bag size to 21-22”. For checked bags, there are size regulations for medium, large, and extra large bags. A medium bag will be ideal if you need just a little more room than what a carry-on provides because its size needs to be 23-24”. A large bag is suitable for two people who want to share one bag. These bags need to fit between 25-27” in terms of size. And finally, you also have the option to bring an extra large suitcase on board. These bags are quite big and bulky, which means they sometimes exceed size and weight restrictions for an airline. An extra large bag falls in the category of 28-32”. Be careful with these large bags so you don’t get hit with unexpected fees. For anyone who is planning to take off on an international flight, keep in mind that bag sizes will different. International carry-on bags are actually smaller than domestic carry-on bags, as they need to be between 18-20”. The reality is, luggage takes a beating during travel. Your bag is in the car, going through the airport, on the plane, taken to a hotel, and so much more. There’s always the risk that something could happen to your bag, whether a handle falls off, a wheel breaks, or something else. To make sure you’re protected, check to see what kind of warranty a piece of spinner luggage has before purchase. If something breaks, you’ll have peace of mind knowing that the manufacturer can help you out. Of course, there’s nothing wrong with wanting spinner luggage that looks great! In terms of style, there are plenty of options to choose from. You can go for a soft shell or a hard shell. For soft shells, you can choose between fabric or leather. You can even choose from a variety of colors to fit your personal tastes and stand out from all the other plain bags at baggage claim. After all, it’s much easier when you can spot your bag in the crowd! Now that you know what you want in a great piece of spinner luggage, there are also a few things you should avoid. After all, a luggage disaster is only going to add more stress to your travels. If you keep an eye out for these things though, you shouldn’t have a problem. It may be tempting to go for the cheapest spinner luggage available, but you won’t be doing yourself any favors. If you go for cheaper options that are poorly made, you’re putting your luggage and your belongings at risk. To avoid the risk of your bag falling apart during travel, look for high-quality materials. You want sturdy handles, tough wheels, and strong zippers to ensure your bag can hold up. Again, going for the cheaper option is just asking for a potential disaster. You’re much better off going for a well-known brand that has a great reputation for crafting quality spinner luggage. Luggage takes a beating during travel. You’re taking your bags in and out of cars, it’s being put on a plane, traveling to your hotel, and so much more. If a bag gets easily scratched or cracked, that’s a good sign that it’s not high-quality. And it’s likely that bag isn’t going to serve you for a very long time. 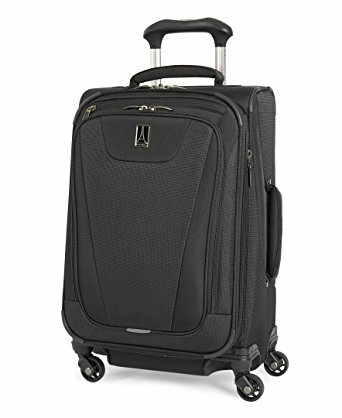 When it comes to spinner luggage, the wheels are the main feature. Wheels that aren’t operating properly will only create added stress when traveling. To avoid this, check out the wheels of a suitcase before making a purchase. Make sure they’re fully functional, well-made, and strong. The unfortunate reality is that sometimes a suitcase’s wheels do break. To make repairs easy, choose a suitcase that has detachable wheels. This makes it quick and simple to swap out a broken wheel for a brand new one. Plus, detachable wheels come in handy when you need to get your bag to fit onto the plane. To help you select the best spinner luggage for your next trip, we’ve rounded-up some of the best options in a variety of categories. Check these out to see which one is your ideal bag! If you need a carry-on suitcase for your next plane journey, the Travelpro Maxlite 4 is a great option to consider. 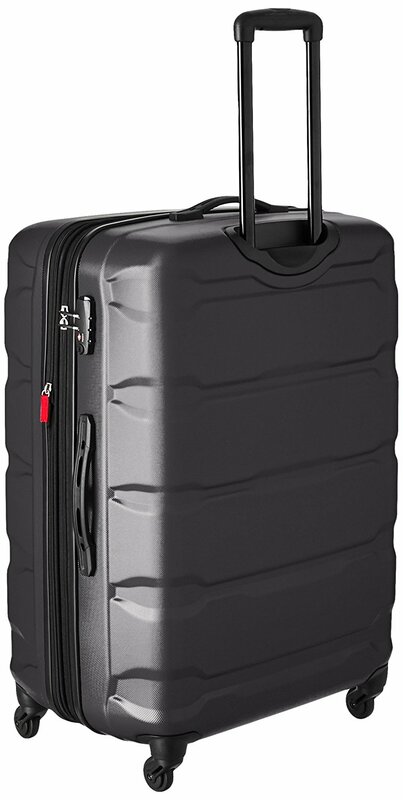 This is a 21” inch, expandable suitcase that will handle all of your precious belongings. Its soft outer shell has multiple outer compartments to help you organize all of your things. The interior has multiple compartments with places to store pressed shirts, accessories, and more. You’ll also love the contour grip of the handle, which provides adding comfort when pushing your suitcase around. If you need a little more storage and you’re fine with checking your bag, the Samsonite Winfield2 Fashion should fit your needs. It’s a 28-inch bag, with plenty of room for all your things and even space to bring back a few souvenirs. It has a hard outer shell that’s made of polycarbonate, which comes it a variety of colors. You’ll love being able to choose one that best fits your personal style. Other great features include plenty of pockets for organizing and a side-mounted TSA lock. Of course, you can’t forget to grab a nice bag for your kids! If you have little ones who need a bag of their own, the J World New York Kids’ Sunslider Spinner Fashion Backpack is just the ticket. With this bag, you have the option to wear it as a backpack or pull it along using its four spinner wheels. The backpack straps are cushioned for added comfort, so you don’t have to worry about it causing back pains. There’s also a front pocket organizer with a pencil holder, a key fob, and a zippered pocket for storage. The measurements for this backpack come it at 9x13x18. It’s important to remember that there are different size requirements for domestic and international flights. If you’re going to be hopping onto an international flight, one bag to look at is the American Tourister iLite Max Softside Spinner. With functional spinner wheels, zippered compartments inside and outside, plus a variety of fabric colors, you’re sure to love it. For European flights and other non-US planes, you will need a slightly smaller bag though. Carry-on bags within the United States are allowed to be slightly larger than what most international flights allow. 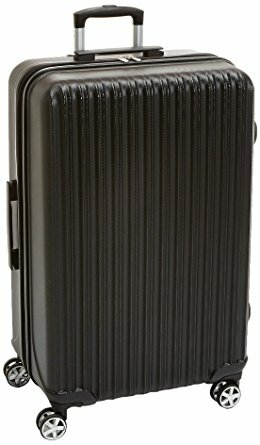 A great choice for spinner luggage with a hard shell is one that we actually mentioned above. The Samsonite Winfield2 Fashion is one to consider because of its sleek design, its durability, and its expansion capabilities. This bag has been made to absorb impact and can even pop back into its original shape to eliminate any dents that occur when traveling. It also has a built in zipper lock that is TSA compliant. If soft shell luggage is more your thing, you’ll want to take a look at the Delsey Luggage Montmarte+ 25 Inch Expandable Softside Spinner Suitcase. It’s made of 1680d ballistic nylon with teflon, so it’s plenty durable for your next trip. This makes it a great option for frequent travelers because you know it’ll stand the test of time. Its expandability provides room for extra belongings, plus the internal compartments allow for easy organization. Plus, you’ll appreciate its polished look and the three color options: black, bordeaux, and navy. If you want to make sure your bag is lightweight and easy to carry, check out the Samsonite Omni PC Hardside. It’s a 20-inch suitcase, which fits within carry-on requirements for domestic flights. The outside is made of polycarbonate, giving it a hard shell that’s durable and easy to clean. It’s also scratch-resistant, so you don’t have to worry about too much damage happening to it during travel. If you’re looking for spinner luggage with a little extra flair, the Raden A22 Carry-On Luggage should fit your needs. 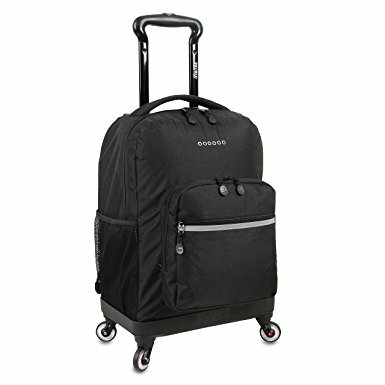 It has a polycarbonate outer shell, four spinner wheels that promise to be silent, a waterproof zipper, and a TSA lock. What makes this bag so cool is the added features. 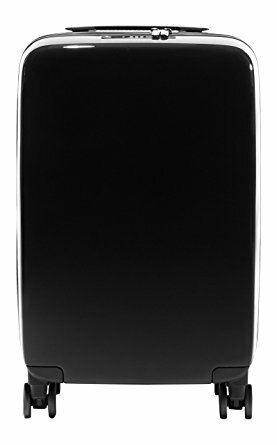 It has an integrated power back with two external USB ports to charge your devices on the go. It has weight sensing that can be activated by just lifting the suitcase. Plus, it provides location tracking. You’ll know where your bag has been and determine its location through its use of Bluetooth Low Energy technology. 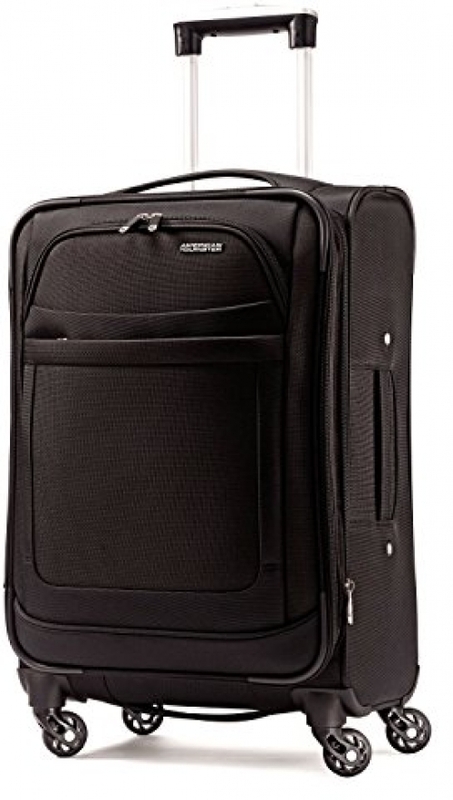 For those who don’t want to break the bank with a new spinner luggage purchase, the AmazonBasics Hardside Spinner will keep some cash in your wallet. It’s only $49.99, but still provides you with the quality you need. It has a protective hard shell that’s scratch-resistant. It can also be expanded for up to 15% additional packaging capacity. Plus, it comes in at 20” in size, making it a perfect carry-on. In some cases, one piece of luggage simply might not be enough. 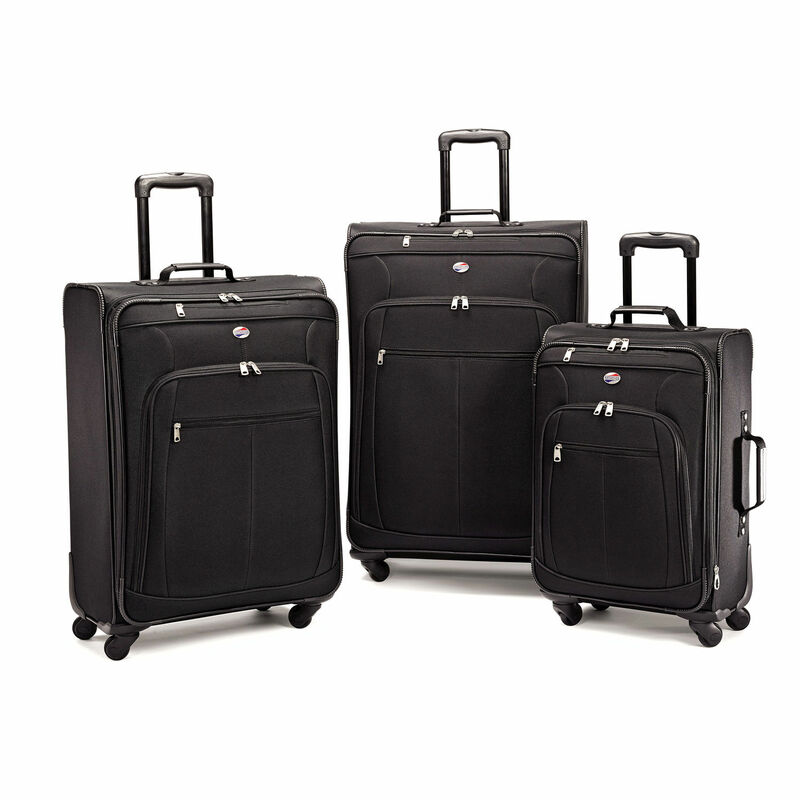 If you need three bags for your next trip, you can get a great deal with the American Tourister Pop Spinner. These bags have padded top and side carry handles to provide comfort during travel. There are interior and exterior pockets for added storage. And you also have a few color options to choose from such as: black, Moroccan blue, navy, orange, purple, and red. Choosing the best spinner luggage for your next getaway doesn’t have to be a daunting task. With these tips, you’ll be able to find a great suitcase that’ll survive many vacations. Make sure you’re making a smart investment by choosing a brand that has a reputation for quality. Also, do your research and test out luggage if possible to ensure its durability. You want to purchase a bag that’s going to withstand traveling. Your spinner luggage should have a tough outer shell, whether you go for something hard or soft. Tough wheels, sturdy handles, and strong zippers are other essentials. The last thing you want is for your suitcase to fall apart in the middle of your next trip! Make a smart decision for your next spinner luggage purchase and you won’t regret it.